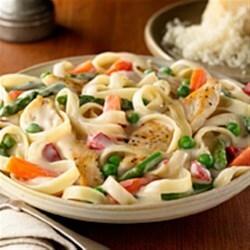 "Slices of chicken and a blend of veggies are simmered until just done in a creamy Alfredo sauce with fettuccine." Heat oil in large nonstick skillet over medium-high heat and cook chicken, stirring occasionally, 8 minutes or until almost done. Remove chicken from pan. Add Recipe Ready Primavera Blend and cook, stirring frequently, 5 minutes or until just tender. Stir in pasta sauce and bring to a boil. Add fettuccine and chicken and toss to coat. * Serve, if desired, with additional parmesan cheese and season with black pepper. This was not a good meal. Will not be making again. This was very tasty and easy to make. Using the Birds Eye Recipe Ready Primavera veggies makes it convenient and quick to prepare! This was good. Though I added salt & pepper, fresh garlic, some fresh basil and some fresh grated parmesan.